Four-fifths of the world’s known platinum lies under South Africa. The country’s platinum mines were at the center of last year’s strikes by mine workers, and its broader mining industry is going through some turmoil. Anglo American Platinum, more usually known as Amplats, the world’s top platinum producer, is planning to mothball two unprofitable shafts and sell off another mine. Yet China Development Bank is backing one of the few new platinum mines there, extending a cheap $650 million loan late last month to Wesizwe Platinum’s Bakubung mine which is due to start production in 2018. In what is thought to have been the first Chinese investment in the sector, the mining group Jinchuan has taken a 45% stake in Wesizwe. Jinchuan is best known as a nickel, copper and cobalt producer though it is also China’s leading platinum producer. However, it has taken a different tack with Wesizwe than it did with its acquisition of South African copper and cobalt miner Metorex. That it bought outright and delisted. With Wesizwe, it has gone the route of being a minority partner. Platinum mining is such a specialized business. There is not much expertise outside South Africa. Jinchuan has a slogan, “We gather the Valuables, The Country and People will Prosper.” The valuables here are platinum mining engineers as much as the metal itself. From Algeria to Zimbabwe, relations between Chinese companies in Africa and their local employees are often uneasy. Violence has broken out before at Zambia’s mines. This time it turned deadly. A Chinese supervisor was killed at the weekend, and two others injured, after a riot broke out over pay at the Collum coal mine in the south of the country. Striking miners were angry that the company had ignored last month’s increase in the minimum wage introduced by the Zambian government. The mine is owned and run by Chinese investors from Jiangxi. The supervisor died after a mine trolley was pushed at him as he and his colleagues fled underground. A dozen miners and local villagers have since been arrested in connection with the death. (Update: police said on Aug. 7th that one miner had been charged with murder and 11 others with rioting and theft.) Two years ago, Zambian police charged two Chinese supervisors at Collum with attempted murder following the shooting and wounding of 13 miners in an earlier pay dispute. The charges were subsequently dropped. Long before that, some 500 Zambian copper mine workers were sacked in 2008 after rioting and attacking a Chinese manager whose injuries required hospital treatment. Despite its recent high-level charm offensive towards Africa–and state media making much in its reports of the weekend’s incident of the benefits Chinese investment has brought Zambia, is all this really what Beijing likes to claim are the “win-win partnerships” it strikes in its natural-resources-for-infrastructure deals with African nations? China is to give a big push to the consolidation of its dirty, deadly and inefficient coal mining industry. For some years thousands of small, dangerous and outdated mines have been closed down. It is these that have mainly been responsible for the industry’s appalling safety record. In the latest such mine accident, five miners were killed and 17 trapped underground on Thursday after a gas explosion ripped through the Dahuang No. 2 Coal Mine, a seemingly illegally operating mine in Liaoyang City in Liaoning. The explosion happened the same day that the new five-year plan for the coal industry was released by the National Energy Administration. This says that by 2015, 10 large coal mining companies (100 million tonnes annual capacity) and 10 medium-size ones (50 million tonnes annual capacity) will be responsible for 60% of the coal output in the world’s largest producer and consumer of coal. These companies will be created by merger and acquisition. Overall, the country’s 10,000 coal companies will be reduced in number to no more than 4,000. Apart from improving the industry’s safety record–China’s largest coal mining companies now have safety records to compare with the best in the world–the closures and consolidation support the official drive to reduce greenhouse gas emissions by cutting the mining and use of China’s highly polluting brown coal and lignite, and to preserve fast disappearing agricultural land which mining operations make unsuitable for farming. Production is to be capped at 3.9 billion tonnes a year by 2015. That is about what the country mined last year. Increased imports, particularly from Chinese-owned mines overseas, will make up the shortfall in demand, which is forecast to increase by 7% a year in line with GDP growth. China’s mining companies will be encouraged to increase their investments in overseas coal fields. The industry will also add domestic coal-production capacity of 750 million tons a year in the five years ending 2015, according to the plan, three quarters of it in the West, as it upgrades to more modern mines as part of the consolidation drive. Beijing has lost a friend in Africa. Rupiah Banda has conceded defeat in Zambia’s presidential election to opposition leader Michael Sata, a man known as King Cobra for his venomous tounge which he has used to criticize China’s often contentious mining investments in the north of the country. The election is likely to affect the way Zambia awards new mining contracts, bring tighter enforcement of safety and labor regulations and higher mine wages, and to see the reimposition of a 25% windfall tax on all foreign mining companies operating in the country. President Banda had scrapped the tax and during the election campaign, he had highlighted the economic growth spurred by Chinese investments. There were reports, denied by Banda’s Movement for Multiparty Democracy, that Chinese firms had contributed heavily to his reelection campaign. It remains to be seen how much of Sata’s populist rhetoric will be tempered by the practicalities of office in the face of such a significant source of foreign investment. China has set a preliminary rare-earths export quota of 14,446 tonnes for 2011, according to the Commerce ministry. The preliminary quota is a sighter for the industry covering roughly the first half of the year. State media announced that as an 11.4% year-on-year cut in comparison to the preliminary quota for 2010, but unofficial comparisons with last year’s numbers put the reduction at closer to 35%-39%. The full year quota for this year is 30,300 tonnes, 40% down from 2009 as Beijing pursues a policy of cutting back rare-earth exports to husband its resources. That quota was exceeded by September, with exports in the first nine months of the year reaching 32,200 tonnes, despite supply interruptions reported in the second half of this year that sent manufacturers who depend on the minerals to produce an array of high-tech goods from consumer electronics to weapons into a flap over suspicions that Beijing was using its current market dominance for noncommercial purposes. China said in July that it would cut exports in the second half to supply its own electronics industry. Quotas were cut by 72% for the second half and prices surged. Meanwhile, as we noted before, the day is fast approaching when rare earths are rare no more. Production is being ramped up in North America, Australia, India, South Africa and Brazil as mines that once looked uneconomic get reopened or expanded. That China has an monopoly that cannot be defended for too much longer is a reason that it is likely to dodge a WTO challenge over its rare-earth exports. Ngozi Okonjo-Iweala (left) is not only a managing director of the World Bank but also a former Nigerian finance and foreign minister. Thus she brings a singularly well positioned perspective to the controversial question of Chinese investment in Africa, and particularly investment in the extraction of the continent’s natural resources. More than 1,5000 Chinese firms are now estimated to have set up shop in Africa. 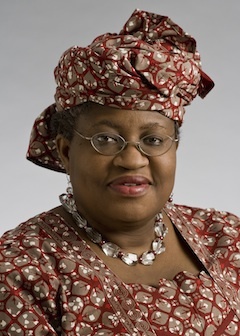 Given the contentious nature of some of their operations, including those from Algeria to Zambia that have caused a local backlash that has on occasion turned violent, Okonjo-Iweala laid out a set of recommendations that bluntly address the most frequently leveled criticisms of Chinese companies operating in Africa. 1. Make investments consistent with national development priorities. Above all, this means to create jobs locally. The only labor brought in from outside must be those people whose skills are clearly missing in a country. In the event of problems with the population or government, you want recourse to adequate legal support to resolve the issue. That can’t and won’t happen if transactions are mired in secrecy. You need to let the people know the scope and broad terms of your engagement. If the public doesn’t know what you do, they will turn against you as they do not see the benefits of the investment or when accidents happen. 3. Support the development of a value chain. Mining companies should not just come in to extract natural resources in a raw form and ship them away. This is colonial history. Today, they should establish some degree of processing adding value to the raw materials. This creates employment, develops skills, and leads to more buy-in from the local people. 4. Pay what is due and do what is right. Investors must pay taxes and avoid falling into well known tax evasion techniques such as transfer pricing or bribes to a few high level officials. Bribe paying is not only abhorrent but is counterproductive in the longer term. Many developing countries need tax revenue to invest in their people – a move which will lead to easier investment for you, but for that to happen, you must pay your proper taxes and royalties. 5. Engage with local communities and communicate your values. Ensuring workers and community safety is an important part of this agenda. Mining companies must operate with the highest safety and environmental standards. It is your company’s reputation at risk if you ignore these standards. You must adhere to them and seek to establish them. These amount to a decent set of best practices for any foreign direct investor anywhere. When it comes to Chinese investors in Africa, though Okonjo-Iweala didn’t explicitly say so, we suspect that her five principles are now mostly honored in the breach — which, of course, would be precisely the point of stating them. Recovery teams have now brought out the bodies of all 37 coal miners smothered by coal dust after by an underground explosion in the Pingyu No.4 coal mine in Yuzhou in Henan on Saturday, Xinhua reports. Two hundred and thirty nine miners survived the disaster. Strenuous official efforts are being made to rid the industry of its reputation as the world’s most dangerous, but this is still China’s worst mining accident since only June.